This entry was posted in Autism and tagged eyes craniopharyngioma doctors referral MRI tumor specialist appointment optometrist crying seeing far-sighted. Bookmark the permalink. 17 Responses to Tears of Joy. OMG! I would have been a crying, freaking out, mess through all of that too. I’m SOOOOOOO glad it worked out this way. Hopefully he won’t fight the glasses so much once he realizes that they help him to feel better. I felt sick to my stomach reading this. I’m so glad the pediatrician finally called you to ease your fears. I hope the glasses help-and stay on his face! Oh what a rollercoaster you were on. I cried along with you and am so glad he has the glasses now. All my love. Oh my gosh, my heart was beating so fast as I read this! I’m so relieved that there’s no tumor. I can only imagine the fear and pain you went through. I can’t believe how dismissive the doctor’s offices were to you. Thank goodness that horror is over. Big hugs to you Karen for surviving this roller coaster of a challenge! I was reminded of my dad’s health issue. Twelve years ago he had cancer in his throat and had to endure severe radiation and chemo treatments. He survived has been well until recently. Now he has an irritation and or lump on the back of his tongue. It could be many things. It could be irritation from esophagitis. It could be scarring from the radiation, which he has and struggles with. It could be cancer. Of course, he believes it is cancer. Until proven otherwise we all tend to believe the worst.Human nature, I guess. We do hope that the glasses remedy all of your son’s recent issues knowing that the bloody noses and irritated eyes are still going to be a problem due to allergies. 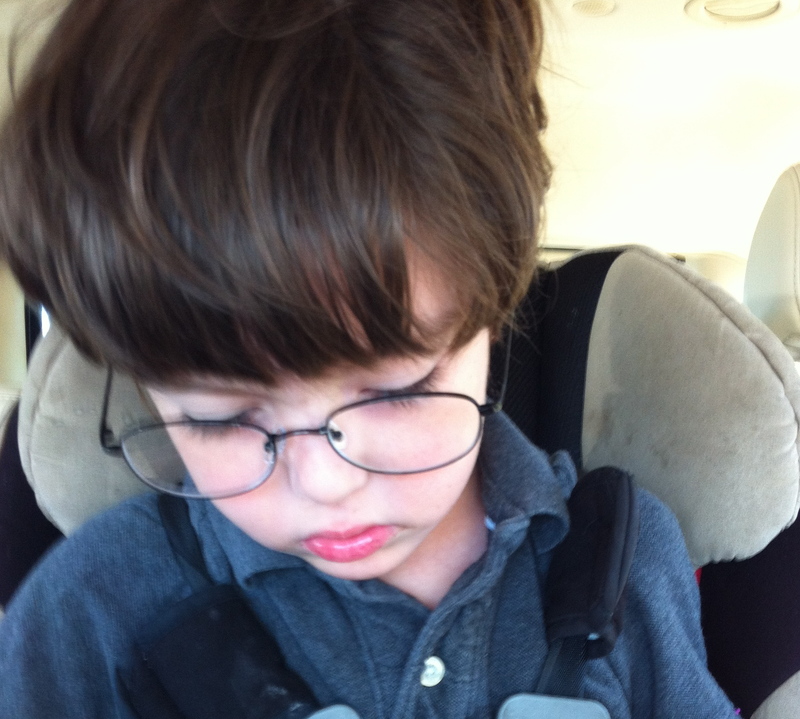 My son wore glasses about that age. I hope you got glasses insurance. Matthew’s were constantly getting tossed on the ground and scratched. I would be SO DONE with that pediatrician about now. What an irresponsible asshat. Am I allowed to say “asshat” here? I hope so… you’re always so polite, but your pediatrician has me completely steamed. Actually, “asshat” is rather mild compared to the words that come to mind. I’m so glad T is all right and he *will* get used to the glasses (plus he looks absolutely adorable in them). One thing that has really worked for us is a thin elastic strap that helps LM keep her glasses on (her nose bridge is nonexistent so without the strap they are always sliding). Our ophthalmologist sells them for $3.50. Let me know if you want one — I’d be more than happy to put one in the mail. Christ, Karen…what a trip! I loved the happy ending here. Sheesh. Glad it is not a tumor, but hate that so many medical professionals let you down. *hugs* I cannot believe the terrible roller coaster ride you have been on and wow….your son 😦 I shutter when I think of how people who are in the health care field to help and soothe can cause so much stress unintentionally and intentionally. It happens here too…I was looking after my terminally Dad a year ago and misinformation and run around when all you want is answers….it doesn’t feel like you are being helped or soothed at all. I am so glad that you could tell us a happy ending and I hope you guys have a nice, happy, and restful weekend. Do keep us posted because our little Gavin complains about “my head hurts” a LOT, as well as rubbing his eyes. Jess had already determined a visit to the optometrist will be the next step, and his teachers at school concur. 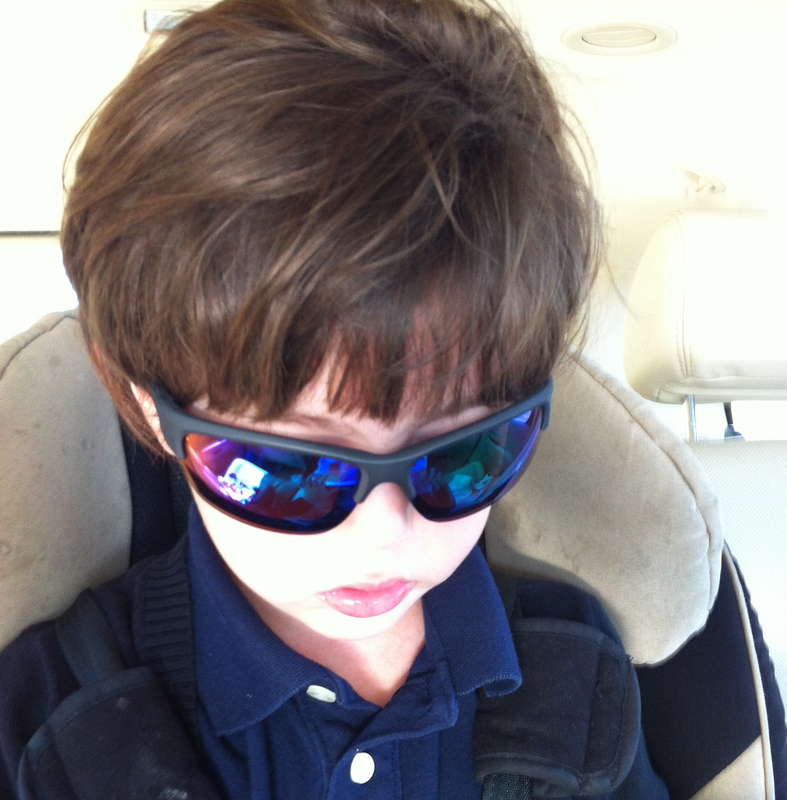 Like you, we know the challenge ahead of trying to get him to wear glasses if this becomes necessary…..
Hope your beautiful little man gets some relief SOON. Oh Karen, I am soooo glad to hear he is okay! I so understand the game of chasing the doctors. Seriously, some of them need a filter between their brain and their mouth. We’ve had a few of those. Go get yourself a big glass of wine and an even bigger bar of good chocolate. You’ve earned it. Hugs. So happy things are working out for you. Wish you all the best. My heart goes out to you. As I read your post, I saw myself–every action you took, every thought you had was mine. I am glad all ended well for you. My affection and warmest wishes. It has been far too long since I’ve been here, I’m sorry for that. I’m so glad T is alright. I swear the things our mind goes through when presented with a worst case situation, I would have been right there with you. Hugs and love to you.